Fashion Icons Attend TIME 100 Gala – Sooo Fabulous! 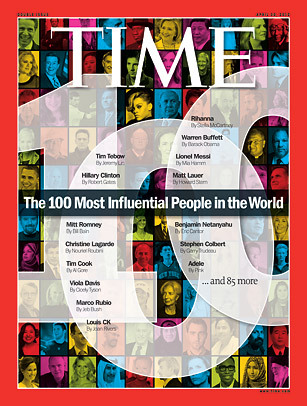 It’s a gathering of the world’s most influential people. Tuesday in New York City, the TIME 100 Gala welcomed some of the globe’s breakouts, pioneers, moguls, leaders and icons. Also spotted on the red carpet were a few who are no strangers to fashion circles. Rihanna, known for her loud style statements, joined designer Georgina Chapman, SPANX creator Sara Blakely and supermodel Tyra Banks at the event. P.S. Check out Stella McCartney’s response to Rihanna being listed on the TIME 100. Read more. Yeah, what was Rihanna doing there? I think she is a wee bit out of place!